Those are my new toys (obviously, my garage does not look like that) and I don’t know if I ever thought I’d be so excited about a washer and dryer. Our old set wasn’t dying, wasn’t on its last legs, wasn’t ancient. But I’ve been wanting a front-loading washer since they came out years ago. The San Diego County Water Authority is still offering rebates for high efficiency washers, but some cities have already run out of them. I figured at some point we would get one, so why not do it when the rebate is still available? Plus, these suckers are supposed to be really water and energy efficient! We’ve saving the planet, one load of laundry at a time! I’ve been watching the sales ads on and off for a couple of years, so I knew what range of prices to look out for. I also did some research on Consumer Reports to see how they rated the different brands and fancy features. They really liked the LG TROMM Steamwasher, but that one is $1400 while the TROMM non-Steamwasher was only $900. I figured that steam technology is not worth the extra $500 and that performance and such was probably the same between the models. 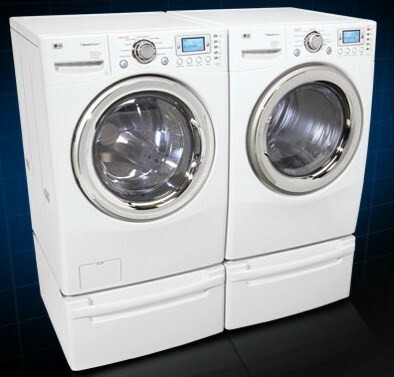 I also talked to a Sears guy and he also recommended the LG brand for front-loading washers. The LG washers have one of the largest capacities at 4.2 cubic feet, but I do admit that I don’t think there’s much of a difference once you get above 3.8 cubic feet. Don’t get me wrong, this was a total splurge purchase, but I did have some logical reasons for wanting it and it was most definitely not an impulse buy. I’m most excited about the new washer because I think it’ll be easier to wash big things (like dog beds) without that big center agitator arm in the middle. So, the washer and dryer finally got delivered and they are even cooler than I thought they’d be. All sorts of buttons and dials and they sing a little song when the loads are done, much like the Roomba. You turn the dial to choose a wash setting and it defaults to temperature settings, spin speeds, etc. Plus! The washer detects how large the load is so you can figure out how much detergent to use. So fancy! The only downside I see is that you can’t stick clothes in for an extra spin cycle like on the regular washers. Of course, I guess you shouldn’t need to because the load won’t ever be unbalanced and end up soggy at the end of the cycle. Because I am a total dork. I actually sat in front of the washer during a wash cycle because I wanted to see how it worked. Maybe I was expecting it to look like the commercial laundry washers, water sloshing all around against the glass window. So, I sat there. And I heard water spraying somewhere (and it wasn’t leaking so I assume the water is in there somewhere) and then the tub spins a few times. Eventually, the clothes get wet. Then the wet clothes slosh around, but as far as I can tell there’s not much standing water. The tub certainly doesn’t fill with water like a top-loading washer. Then it goes through 2 rinse cycles, with a little more wetness, but still no water level against the window. If this is how it’s supposed to work, I can totally see how it uses 75% less water than a conventional washer. It’s crazy! But the clothes come out smelling and looking clean, so I’m inclined to trust it. When the washer drains, I seriously didn’t understand where all that water was coming from. My high tech washer has confused me! The dryer supposedly has a sensor to detect the moisture levels in the clothes. The first load I did with sheets came out a tad bit damp, so I don’t know if the sensor is off or the setting is. I think it’ll take some fiddling to get used to how the dryer settings work, but I’m sure it’ll be fine. Both have digital displays that tell you how many more minutes are left until the load is done. The dryer even has sensors that check to see if the exhaust is blocked. Very cool. We’ve had the washer and dryer for one whole day, so I can’t comment on anything other than my first impressions. But, so far, I do love them! Front loaders!!! I have ’em, and I love ’em. With all those options, sorta dry, real dry, extra dry, spin, spin harder spin ever more! Mine came with the house I bought last year. I still don’t think I have tried all the settings. Have fun!